Over the years I've come across (and created) quite a few fun decorative soap making ideas that I would like to share with you. Most of the ideas listed are very easy to do and don't require any special ingredients or difficult to find tools. With a little imagination and some extra planning, you can come up with some amazing designs to put into your hand made soaps. This unique design is referred to as the butterfly swirl technique because, as you can see in the picture, when two bars are placed side by side, they resemble a butterfly. Using what is called a 'hanger tool', you can create many variations of the soap pictured simply by changing up your swirl pattern. Follow the link to the step-by-step instructions and a short video that will walk you through the process to creating your own lovely butterfly swirled soap. 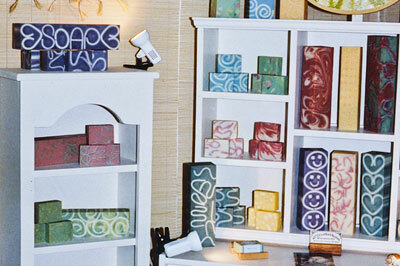 Water and heat can be used as a design tool in the soap making process. Learn how reducing your water in a portion of your soap batter and forcing the gel phase can give your soaps a unique look. In the soap pictured, I incorporated this technique along with using yoghurt and white mica to achieve my desired effect. Learn how to do the Taiwan Swirl technique. Using dividers in your soap mould, you pour stripes of alternating colours and then use a skewer to drag the soap across each colour. You could stop there or continue and run the skewer up the coloured stripes like I have in the soap pictured. Try playing with different colour combinations to create fantastic swirled effects. This style of soap design is created by grating hand made soap and adding it to an alternately coloured soap base once it reaches a medium trace. For best results use fairly fresh soap bits and make sure the bits and base colours contrast nicely. When shredding the soap, I use the regular cheese grating size and spread the shredded soap out in a flat layer to dry slightly so that it doesn't clump together when I add it to the base soap. It is also important to always have soap bits at room temperature and not chilled or cold when you add them to the base. Adding cold soap bits to the base can cause white speckled chalky blotches that ruin the design. 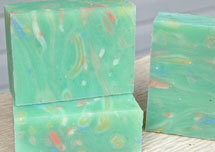 This soap making idea is so simple and yet can produce a large variety of looks. Cut up left over ends and bits of soap in varying sizes, colours and shapes and add them to your medium traced soap base. Try large dark chunks in a light base or lots and lots of small square multicoloured bits. Add the bits to the whole base or just to one layer. A great look can also be achieved by dusting the chunks of soap in mica or cocoa powder, etc. and layering them with the base soap in the mold. 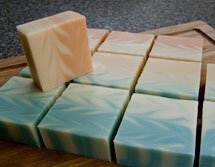 Each soap chunk will have a defined outline of darker colour. The soap curls design has been my signature look since I first started making my soaps decorative. Early on I discovered that you can easily manipulate strips of soap into interesting shapes. I've made happy faces, wave patterns, tight ruffles, s-hook shapes, hearts, the spiral (my favourite...just in case you haven't noticed! ), strait sticks and even embedded the word 'soap' in a long block. 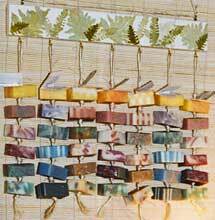 Below you can see a picture with some examples of what you can do with strips of soap for embedding. If you're anything like me, you hate to waste leftover scraps of soap. Making soap balls is a wonderful way to use them up. The possible designs you can create are many, including embedding chunks, adding flower petals and layering. Try cutting large soap balls in half. This gives a nice flat surface to wash with while the curved edges fit very nicely into your hand. It also shows off any interior designs you might have put in the soap ball. You know all of those ends and not quite even bars that pile up? Well this soap making idea is a wonderful way to make use of them. It not only provides people with a sampling of your soaps but it can conveniently hang in the linen closet making everything smell nice until the next bar is needed. Simply cut the bars in half, drill a hole in the centre of each one and thread some twine through. Make sure to wash and dry the drill bits after drilling the holes or certain members of your household my become slightly miffed with you the next time they go to use their tools!! I start by cutting a long length of twine and making a hanging loop at the top with a knot. I then thread one bar on and tie another knot. Keep adding bars until you have as many as you want and tie a final knot at the bottom leaving a nice tassel. To use, you just cut off the final knot and pull the soap off. Since the other soaps are all knotted individually, they stay in place. Much like soap curls and confetti soap, this soap making design idea incorporates placing thin strips of soap into a contrasting soap base. To create soap ribbons, you will need a stainless steel cheese slicer. I picked mine up at Superstore quite a number of years ago but they are available at most department stores that sell kitchen utensils. 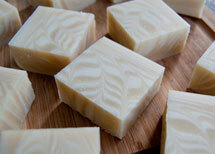 Adding a checker board pattern to your soap is easy. Make a batch of soap and cut it into long stick like strips. You then place them in the soap mold and pour in your contrasting soap. It is important, when making checker board soap, to pay attention when cutting the loaf of soap. You must make sure that when you cut the bars, you are cutting across the sticks or else you will have a striped soap instead! If you trim your soaps, you can use the trimmings to create mini soap balls to embed into your soaps. After each trimming session, simply roll the soft soap bits into small round balls and then use them the next time you make a batch of soap. The balls can be added directly to the soap base or pushed into the freshly poured loaf of soap. Be aware that the base soap must be at a medium to thick trace in order for the balls to stay suspended and not sink to the bottom of your mold. Try rolling the balls in mica, cocoa powder or other powder as well to provide even more contrast between the soap balls and base soap. This lovely decorative soap making idea has been around forever! Using a simple pipe mold that you can create from plumbing parts found at your local hardware store, you too can make round soaps and loofah soaps. It is important to line this soap mold as it is next to impossible to remove the soap if you don't! I know this from experience. Baking mats, plastic film and butchers paper are good examples of liners that will all work in this type of soap mold. 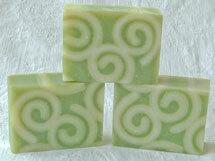 The spoon swirl soap design is fun and easy to do. I does require some planning and can take a little bit of time but it sure does create some great looking soaps. With this design you will create anywhere from 2 to 6 or so colours and literally spoon the soap into your soap mold while alternating colours. 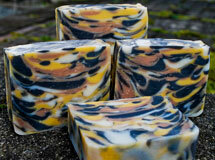 By filling the soap mold this way, it creates a lovely patterned layering in the soap that can be very striking. 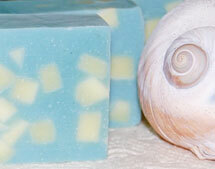 You can't help but enjoy making the funnel swirl soap. With it's graceful sweeping curves of layered colour, it always makes a good impression. You can leave the soap design 'as is' after the pour or create a 'star-burst' pattern by dragging the soap with a skewer from the centre out to the edges in a '+' pattern and then from the outer edges to the centre in a 'x' pattern. The star-burst is best done in a sheet mold rather than a loaf mold. 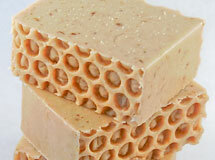 The honeycomb effect is one of the most ridiculously easy soap designs to create! Save a scrap of bubble wrap the next time you get some in a shipping parcel. The smaller 3/16" to 1/4" bubbles work best. Cut the wrap to fit the bottom of your soap mold. Place it into your lined mold with the bubbles facing up. Pour your soap onto the bubble wrap and wait for the soap to set. Once the soap is cool and firm to the touch, you can unwrap it and peel back the wrap off the bottom. The bottom of the soap is now the top! And it looks great!